Charlotte-based chain formed through the merger of Harris Supermarkets and Teeter’s. Operated BIG M (More Value) discount stores during the 1970s. Acquired Food World in 1984 and many Big Star stores in 1988. Expanding rapidly throughout North Carolina and Virginia. South Carolina and Georgia operations have been less successful, and Atlanta market was abandoned recently. The company is expanding in Virginia/Metro DC. 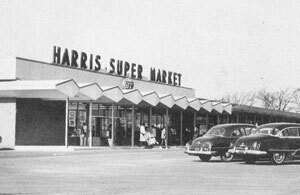 In 1936, W. T. Harris borrowed $1,500 to open his first grocery store in Charlotte, NC. He was a pioneer in the grocery industry, opening his first supermarket in 1949 that featured air-conditioning, and remained open until 9 p.m. on Friday nights! Meanwhile, Willis L. Teeter and his brother, Paul, borrowed $1,700 to open their first Teeter’s Food Mart in Mooresville, NC, in 1939. The two young, prospering companies first combined efforts in 1958 when they pooled their buying efforts and storage facilities. On February 1, 1960, Harris Super Markets and Teeter’s Food Marts officially merged to form Harris Teeter Super Markets, Inc. There were already 15 stores in operation. The first “Harris Teeter” store to open under the new banner was in Kannapolis, NC. Within three years after the merger, 25 stores were in operation. A new, larger warehouse with office facilities was opened. Harris Teeter further expanded its marketing area by purchasing five supermarkets from Tilman’s Grocery of Shelby, NC, and two independent grocery stores, one in Charlotte and one in Gastonia. In 1969, Harris Teeter was purchased by the Ruddick Corporation of Charlotte, NC, a holding company traded on the New York Stock Exchange. In 1984, Food World, a successful supermarket chain headquartered in Greensboro, NC, was purchased by Ruddick and merged with Harris Teeter. Food World was started in 1917 by George E. Hutchens of High Point, NC. Food World’s market covered much of central North Carolina and parts of Virginia. The merger increased Harris Teeter’s coverage to four states and 7,000 associates, making it the second largest food chain in the Carolinas. Food World added 52 stores, a distribution center and nearly 3,000 associates to Harris Teeter. In 1988, Harris Teeter purchased 52 super-markets operating under the Big Star name and a warehouse from the Grand Union Company. In 1990, Harris Teeter acquired Borden Dairy Plant which, in conjunction with Harris Teeter’s Hunter Dairy, greatly increased dairy product production. Harris Teeter also purchased a 97,000 square-foot building in Matthews, NC, and moved its corporate offices to that location. In 1993, Harris Teeter purchased five South Carolina Bruno stores. This acquisition substantially increased Harris Teeter’s share in this growing market. A 550,000 square-foot non-perishable distribution and transportation facility is located in Greensboro, NC, along with a 139,000 square-foot freezer operation that opened in March 1991. Perishable products are handled at a 300,000 square-foot distribution facility 12 miles east of Charlotte at Indian Trail, NC. Recently, a new perishable facility was completed in Greensboro and a non-perishable facility was added at the Indian Trail location.